Netsed naturally only works on computers that route packages (i.e., routers, e.g., under OpenWrt) or on servers that provide this service. Like a proxy, the software sniffs the data stream from a defined connection and then manipulates it in-line according to rules you define. You can either launch the program manually or add it to a shell script. If you use local port numbers higher than 1023, you can make do with normal user privileges; otherwise, you need to be root. Even if the term exists multiple times, the tool will only replace it once in this case. After this, Netsed outputs notices on packet forwarding and handling. Figure 1, for example, shows a successful search and replace action (Applying rule outlined in red), and Figure 2 shows the result. Figure 1: The initial messages and program output from Netsed give you a good idea of the current status and successful replacements (outlined in red). Figure 2: Top: The original page, as served up by the web server. Bottom: The variant manipulated by Netsed. The first task is to replace the string Test once only with Trial. The second instruction removes the link to a search engine and replaces it with the message Search engine locked. The last two instructions replace the server's IP address and hostname (Figure 3). Figure 3: Netsed also supports more complex manipulations of the output. You need to quote any forward slash (/) that is part of the Netsed command by using a percent character and the hexadecimal equivalent of a slash (%2f) from the ASCII table. 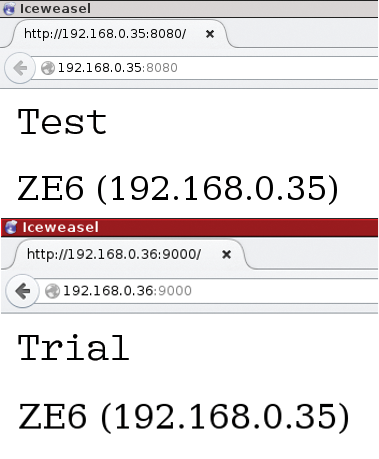 Netsed provides a relatively simple approach for manipulating unencrypted data transported by a network. The test setup shown in this article is basically intended as a proof of concept to show how easily cleartext can be manipulated. For this reason, it always makes sense to check your websites and hide the imprint in graphical elements instead of using cleartext HTML. This makes it more difficult for attackers to produce spurious website copies. Harald Zisler has focused on FreeBSD and Linux since the early 1990s. He is the author of various articles and books on engineering and IT topics.